Automotive EMC Testing: Domestic Autos | Elite Electronic Engineering, Inc.
Elite is the leading laboratory for automotive EMC testing and electrical testing. We have achieved this status by leveraging our decades of military and regulatory test experience and applying it to the automotive testing industry. The company has invested its resources into dedicated equipment, test chambers, quality audits, accreditations, and personnel to become the most recognized and approved lab by the automotive and truck OEMs. We have multiple sets of the equipment needed to perform your tests. This assures that your project completion will not be delayed because of test equipment issues. FCA (Fiat Chrysler), Ford and GM have worked together with the American Association of Laboratory Accreditation (A2LA) to develop a quality system accreditation specifically to assess automotive EMC test laboratories (previously known as AEMCLAP). This rigorous quality assurance program includes on-site assessment by A2LA auditors of Elite’s test and calibration process, equipment, and personnel. It also includes proficiency testing that establishes correlation between the test results measured at Elite with the results from the FCA (Fiat Chrysler), Ford, or GM reference laboratories. Test Plan - IMPORTANT!!! Please note that for any domestic OEM EMC testing, an aprovedl test plan is required from the supplier for design validation or production validation tests. The test plan must be approved by the OEM and be available to Elite at the start of testing. Without it, the testing will be considered “engineering development” and the results will not be formally accepted by the OEM. Test Harness - The supplier must provide suitable harnesses as described in the OEM specifications. Elite has specialized fiber optic equipment and feed-through filters to interface signals into and out of its chambers and test equipment. To request a specification sheet for the harness configuration contact an Elite sales engineer at sglaya@elitetest.com and we will get you the needed information. Test Monitoring and Control Equipment - The supplier will need to supply all communication bus simulation equipment, laptop computers, test item loads, I/O simulators, fixtures, or other systems necessary to fully function the device under test. We recommend the supplier functionally check the test item, monitoring system and harness prior to shipping to Elite. Laptop computers and other specialized equipment needed for test item operation and monitoring are available for rental. Elite must be made aware of any special equipment needs during the quoting stages so the costs of that equipment can be included in the quotation. EMC and Environmental Stress under one roof. Elite’s one location for full DV and PV testing offers convenience and saves time and cost. Satellite Radio (Sirrius & XM) test tone generators required for immunity testing on automotive stereo systems. Elite has met the exacting standards demanded by FCA (Fiat Chrysler) to be your fully approved third party EMC test lab. When our clients seek FCA validation services, our test labs can provide it—without compromise and without question. Elite is fully approved for all sections of the FCA CS.00054 specification (as well as the older versions of the Chrysler standards) to assure the acceptance of test results. As one of the original approved Chrysler third-party test labs, Elite has extensive experience dealing with FCA-specific test methods and administrative processes. We have the ability to handle multiple projects and provide flexible short-notice scheduling. Elite engineers can assist with test plan development, EMI suppression, and EMC design. We have 600V/m Radiated Immunity Mode Tuned and Absorber Lined Chambers. 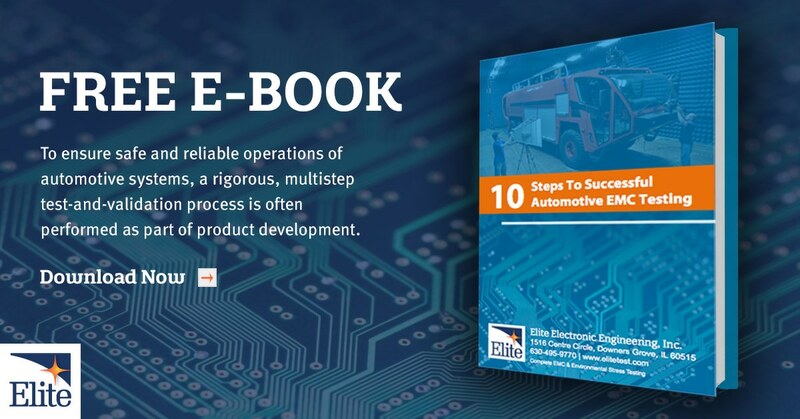 Having decades of experience with General Motors test methods, Elite can provide the firsthand knowledge and experience to get your product tested—and accepted—into the GM system. Our GM capabilities include anechoic chamber or reverberation chamber mode tuned testing for the Radiated Immunity Radar Pulse Packet Testing at 600V/m. Elite is fully recognized for EMC testing by the Ford Motor Company for testing to their EMC standards. Utilizing a Ford-approved EMC test plan, you can be assured Elite test results will be accepted for your DV and PV submittal. We have the experience, equipment and people to get your product tested accurately and on time. Elite is experienced with Tesla EMC requirements and capable of performing all of the component test methods specified in TS-0000425-03. Depend on our automotive EMC experts to complete all your Tesla testing in one place, saving time and cost.